On Tuesday 11th November we commemorated the 90th anniversary of the end of the first world war and remembered those who had died in the conflicts of the 20th and twenty-first centuries. At eleven o’clock I took part in the two minutes silence in perhaps the most unusual and most tranquil place I had ever observed it- on a canal barge. For several years I have been part of a team accompanying several people with profound disabilities on a barge trip. 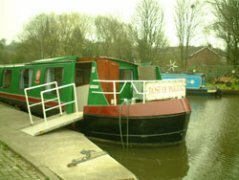 The barge, the ‘Rose of Parbold’ is adapted for easy access and has huge windows so that no matter what the weather you get a beautiful view of the English countryside moving past you at two miles an hour. I have never known anyone who was killed in a war. My great uncle, Harry Bolton, died in the first world war. The family still have a photograph and the certificate which was sent out with the king’s stamp. Thanks to the War Memorials website I was recently able to find out where he was buried in France. I never knew him, but thought about him this year. And the thoughts were mixed, as were those about more recent conflicts. Somewhere in the mix, stirred in with the exclamations of gratitude and honour, there are uncomfortable question marks about futility and waste and the necessity of involvement. Twenty years ago I was working in a team which was resettling people with learning disabilities from a Victorian ‘Mental Handicap’ hospital into a home in the community. ‘Care in the Community’ has come to have some negative connotations, but we must never forget the horrendously dehumanising alternatives of the past. One our senior staff members was a brilliant and inspirational young man called David Heffer. David had been a Mental Handicap Nurse, so understood his territory. He was one of the staunchest advocates for people with learning disabilities that I have ever met. He made peoples’ lives better, and my book ‘Tasting the Wind’ is dedicated to him. The last time I saw David he was selling his belongings to fund a trip to India. He was like that. A free spirit. About five years later, October, 1992, I was chatting to my wife when a name jumped out at me from the ten o’clock news. The IRA had bombed a pub in Covent Garden and one man had died: David Heffer. The following day I bought so many papers, trying to find out if it was the David I had known. The montage of information formed a clear pattern: It was a David Heffer who had been a nurse and had travelled in India. He had called in at the pub on an errand. I won’t dignify the people who planted the bomb by suggesting that they were in any way soldiers fighting a war. But they took the life of someone who was capable of heroic acts for other people, so every November 11th I remember David Heffer.